Kyle Miller had a late penalty saved as East Kilbride and Cowdenbeath drew 0-0 in the first leg of their Ladbrokes League Two play-off final. Cowdenbeath, trying to avoid dropping out of League Two, had a glorious opportunity to take a 1-0 lead back to their ground but Miller's 87th-minute effort was kept out by goalkeeper Matthew McGinley. 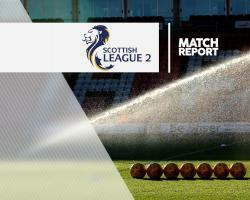 East Kilbride, Lowland League champions, had their chances in the second half but striker Joao Pereira Vitoria had a couple of efforts saved by Jamie Sneddon before his 74th-minute header came back off the crossbar. The visitors pressed for a late winner but David Syme's header was kept out by McGinley, who was then the hero after Fabio Capuano handled in the box.